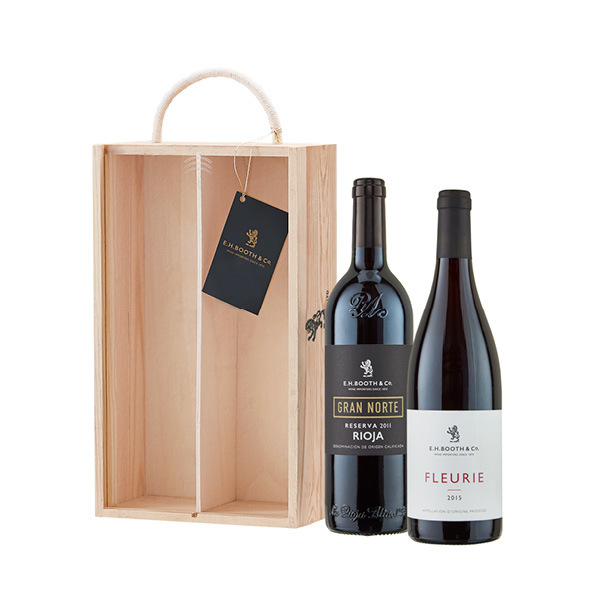 Two fantastic bottles of Booths own label red wine, beautifully presented in a branded double wooden gift box featuring a clear sliding lid and rope handle. So whether you’re looking to surprise a friend, family, loved ones, clients, colleagues, teammates or bosses – from rewards to thank yous, events to celebrations. Our beautiful gifts will certainly go down a treat! Booths Fleurie – Made using the hand-picked fruit of old vines grown in the lovely village of Fleurie, in Beaujolais, this elegant wine is the result of traditional production methods. The Gamay grapes produce a fabulously floral perfume, with peony and iris aromas joining crushed berries on the nose. There are flavours of luscious cherry and rose, with a hint of spice and good substance. Try it with leg of lamb or serve lightly-chilled with roast chicken or pork.